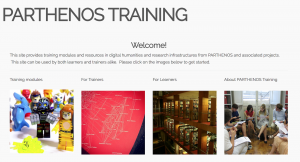 PARTHENOS Training has been developed as part of Work Package 7 in the PARTHENOS project. As part of this work, the work package developed a Training Plan, which has been updated following feedback. You can access the Training Suite website by clicking the link below.